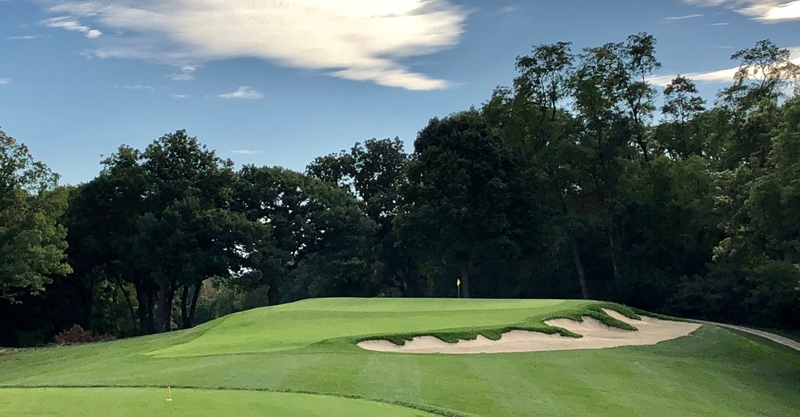 Conversation about Chicago golf often focuses on the big names – Chicago Golf Club, Olympia Fields, Medinah – and fairly so. But Chicago is also home to quite a few classic courses that qualify as hidden gems. I am fortunate to have access to regularly play one of those gems, the Langford & Moreau designed Bryn Mawr Country Club. 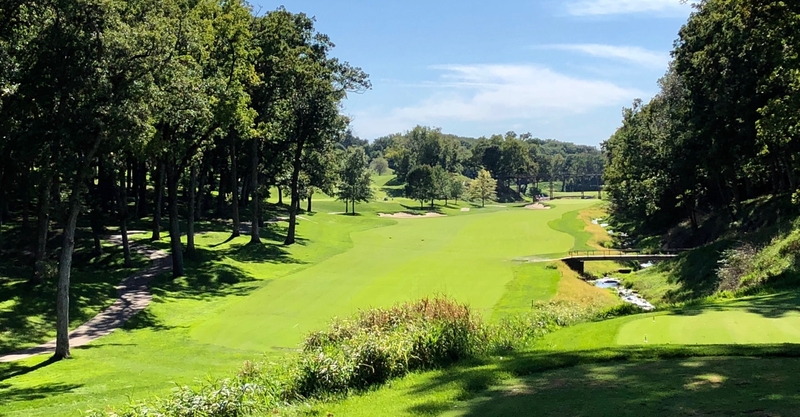 Bryn Mawr is a beautiful course and has always been tremendous fun to play. To quote my friend and BMCC member Peter, “I travel all over the country and play all of these great courses, and when I come home, I realize that my favorite course in the world is Bryn Mawr.” In 2013, the club undertook a renovation project led by a collaboration of Golf Course Architect Jim Nagle of Forse Design and Superintendent Brian Bossert. Tree removal added scenic beauty and new strategic decisions. Bunker repositioning and updates added interest and challenge. Reshaping of green complex run-offs and chipping areas added variety and fun to the short game. Having had the pleasure of experiencing the final product, I was curious to learn more about the process. Jim and Brian were kind enough to agree to share about the practice of their craft, and their work together. Also included are photos from Jim of the par 3 6th and 16th, the par 4 3rd and 11th, and the par 5 18th. BB: I grew up a couple hours south of Chicago; in Dwight, Illinois. The local golf course provided a very encouraging environment for a young boy to experience the game. Golf is hard to learn, but my best friend was from an enthusiastic golfing family and was already very proficient when I got started playing in grade school. Additionally, even the best adult players at our club willingly spent time teaching us to play. We took lessons, played all the time and long story short; I fell in love with golf as a player. There were numerous work opportunities at the local course; cleaning up after dinner parties, retrieving lost balls in the water hazards and then working in the pro shop and eventually on the course. I enjoyed seeing how just a few hours of hard work could result in a better looking golf course. We had fun on the job too; decided to pursue it as a career path. It’s amazing how many folks from the little town of Dwight ended up in the business; all a credit to the encouraging community and supportive parents. Golf was very accessible for me; also reasonably priced and it was fun. The opposite seems to be some of what is keeping youngsters from experiencing the great game today. JN: This question could be answered in so many ways. Looking back on it now, there is no doubt the desire was there as a kid to do something in design. It wasn’t until July 1986 that I discovered that golf course architecture was an actual profession. At that time, I was headed to either Brandeis University to study architecture or Roger Williams (outside Newport, RI) to study construction sciences with a desire to restore/rebuild old homes – kind of a This Old House vision. Once I discovered golf course architecture and how it combined so many things I was interested in – golf, designing, drawing and construction – I decided to pursue a degree in Landscape Architecture. There are so many moments from that July epiphany to when I actually ended up working full-time – chance meeting with Pete Dye, a classmates father building the Pete Dye Golf Club (WV), a Landscape Architecture firm hiring a kid out of college to get them into golf design, working my summers for Dye Design, meeting Ron Forse are just a few – that I have come to truly see that I am where I am today through Providence, and not luck or coincidence. It makes me thankful every day when I really think about what I am doing. As for meeting up with Ron Forse, we met while I was a student at West Virginia University when we had Ron come down and speak with then associate, Bruce Hepner. He and Bruce talked about their various projects wherein there was an emphasis on the growing work in classic restoration. I was fascinated by their presentation. With restoration you add history, archeology, the roots of the game as it came to America, various designers and their tendencies on top of the other aspects of golf design. It was very intriguing. Ron asked me to join him in early 1998 and I left the firm I was working with and have been a part of Forse Design since then. JN: Both Brian and I were attending a Men’s Prayer Breakfast at the Golf Course Superintendents Annual Conference and happened to be sitting beside one another. Brian’s name tag indicated he was from Illinois. I was born in Illinois but moved away to PA at a very young age, but all of my relatives still live in IL and we return as often as possible. Anyway, I asked him where he was from and he indicated North of Chicago. Told him I was born in the Central part of the state and still had family there. Now my hometown is a town of 450 people. Not many people know a town in Central Illinois with a population on 450. Brian did! He was born in a town just 15 miles away. Turns out he also played competitive golf against the family which my Aunt married into who owned a course outside of Streator, IL. The coincidences kept piling up. It was a great introduction and a “foot in the door” opportunity to talk about working with each other. Thankfully, we have developed a great working relationship and friendship, even after discovering we root for baseball teams on the opposite sides of Chicago. BB: Small world one would say. I tend to think it was meant to be. Describe your process for a renovation project of this nature. BB: From our end, it started with need. Players are generally more in tune to conditioning needs vs. architectural enhancements and we had some playability/conditioning issues. 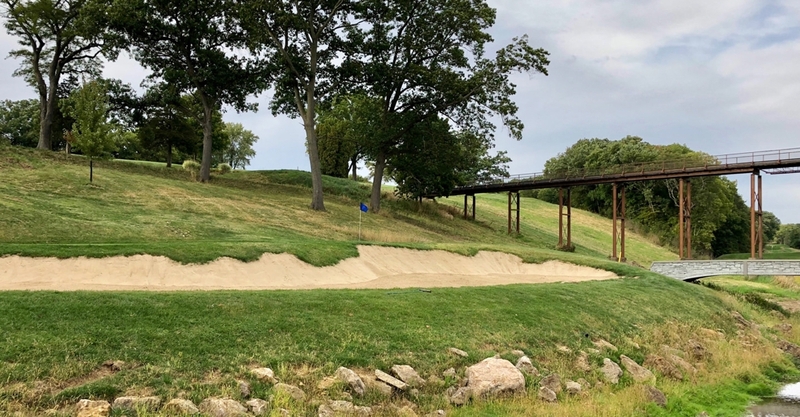 Bunker conditions were inconsistent and in some cases poor, an excessive number of trees were compromising turf quality and site lines, and drainage issues existed on the flat property. There was also a desire for a more interesting course with additional variety; the playing experience needed to be more memorable. I would say that we weren’t long on “wow factor”. JN: Forse Design looks at every project in the same manner. 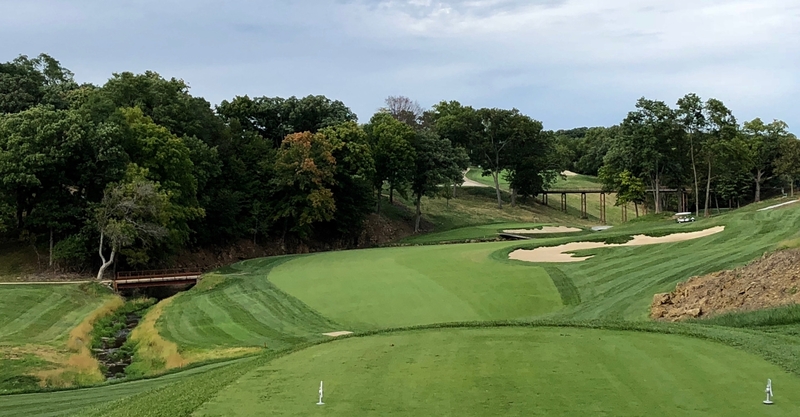 Be it new, restoring a classic course, a retro-rebuild (start over from tee to green) or a renovation project, we always begin with reviewing the course and looking at three elements: Strategy, Naturalness and Variety. We also look at the foundation of the course, its routing and green complexes. In many cases these two items are not going to change, but it provides insight into how good the course is and what we can do with it. We have to also look at the “genius of the place”. What about the overall appearance, playability, memorability and enjoyment of the course do the members discuss the most or what we see as being worthy of recognition and to build upon or enhance. As one can see the process is approached from many different angles. Strategy. A good golf course is one that tests the golfer’s wit as well as his ball-striking ability. Strategy requires a golfer to apply varying values to his successive shots on a golf hole. If a golfer risks a hazard on the tee shot he should be rewarded with an easier approach shot to the green. Strategy implies alternate routes from the tee to the green. This means that the golf hole should be sufficiently wide to give players choices of direction. The golfer may choose to hit around trouble but has a proportionately lesser chance at par if he does so. The bunkering and other hazards thus come into play for the bogey golfer as well as the scratch golfer. The beauty of the strategic design is that the bogey golfer can enjoy his round as much as the scratch golfer. Also, these strategic courses are forever enjoyable for every golfer’s ability. Variety. Monotony is the enemy of a well designed golf course. A good course has as much variety as possible in the look of the holes, the types of shots required, the holes’ direction, and the lie of the ball on the terrain. God-created ground is infinitely more interesting than most of what man can make. Ideally, the sequence of par is broken up and each hole has its own distinct character. Furthermore, each green is unique and all the bunkers are distinct. Naturalness. Nothing on a good course is done in a contrived or unnatural way. It should always look as though nature had the part in the creation of the features. 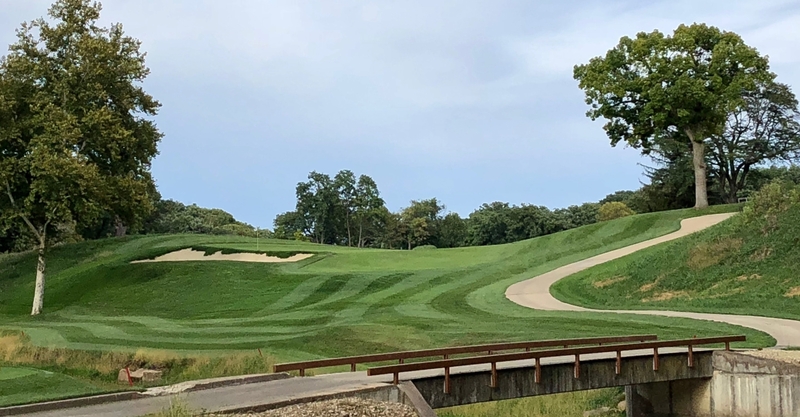 When dealing with a restoration the architect must be able to understand the original designer’s traits, his style of green contours, bunker placement, scale, size and configurations. 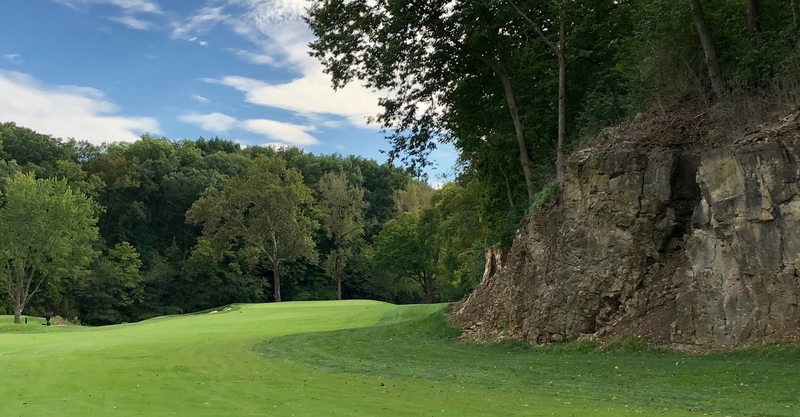 Forse Design is known for being able to discern these principles and apply them appropriately to the topographic opportunities and character of a course. Bryn Mawr has a challenging collection of par 3s, including the side-by-side 6th (long) and 16th (short). This area was the subject of significant tree removal which opened up outstanding views. BB: There were several; a partial list would include more teeing options, a more challenging finishing hole, opening up the corridors of play and addressing the bunkers. With Jim’s guidance, we were able to do this and recapture some of the original architectural intent and genius of Langford and Moreau. Recapture original green edges and thus the available (increased) cupping areas. Provide agronomically sound and level tees. Provide a more challenging 18th hole. Provide playable golf holes for ladies and seniors. Restore strategy and shot-value to the golf course. Retain and/or relocate hazards consistent with restoration of shot values, modern playing equipment and turf grooming practices. Restore original green designs and edges, thus increasing the available cup locations. Restore/create bunkering scheme that infuses a variety of character, distances, locations, severity/ease and recovery techniques, especially for fairway bunkers. Provide continuity in the appearance and playability of all course bunkers. Provide bunker faces/edges that reduce the need for edging or turf replacement. Emphasize ground and other terrain features. Accentuate specimen trees and eliminate vegetation that is not compatible with healthy turf. Reopen closed lines-of-play. Reestablish multi-angled shot options. Make the golf course as safe as possible. Reduce maintenance problems and associated costs. One item that was very important to us was correcting (expanding) the scale of the bunkers. Langford did a masterful job creating undulations on what was an otherwise flat property. His earliest plans and early photos of the course show large bunkers of irregular shapes and sizes. When we came to the course we found large bunkers but many of the sand lines were hidden by mounds of earth or capes sweeping into the bunkers. We felt strongly that the size of the bunkers as seen in the earliest photos needed to be larger and more visible. Scale was the one word we kept repeating through the entire process. We have come to the conclusion that larger bunkers are necessary on flat courses. The course also has three short par 4’s (#’s 3, 7 & 11) which were similar because of the tree-lined fairways, bunker schemes and limited visibility of the sand, and as with most of the course the greens were fronted both left and right with sand. When a course has 18 holes of greens fronted both left and right with bunkers there is a need to create more variety by modifying their locations around the greens or by eliminating one or both of the bunkers. We wanted to make three distinct short par 4’s, each of which would become memorable and unique. Additionally, the par 5 5th and 15th holes are parallel and had similar issues as the short 4’s. We had to make each stand out. Bryn Mawr’s par 4s can make you hit every club in the bag. Particularly fun are the short 4s – risk/reward at its finest. What were your biggest concerns going into the project? JN: Trees, trees and trees. Trees and forward tees can be the most controversial issues for any master plan. People love trees and hate to see them cut down and it seems women do not want to play a shorter course (perceived as easier or their handicaps do not travel well). The latter is often proven to be untrue once the ladies have an opportunity to play from shorter more equitable tees. Not necessarily easier tees, more equitable. At the time of our initial visit Bryn Mawr was one of the more overly populated courses when it came to trees. We see it a lot, no one person is to blame. We just wanted to take a sensible approach to tree management. Luckily the club had already initiated a tree management program prior to our arrival. We knew things were going to work out in the long run after they took our advice prior to hiring us and uncovered one of the most beautiful and graceful Elms I have ever witnessed. Based on our recommendation they cut down any surrounding inferior tree that was impacting the Elm or a view of it. It’s what we call accentuating a specimen. Another concern of the committee was to give them a finishing hole that they could be proud of and create greater tension for its members. We felt confident we could meet those desires. BB: I was very concerned about our timeline. We didn’t get started until the middle of September; we knew going in that a percentage of the work was going to spill into the following spring. I never like counting on spring weather for construction. Of course I was also concerned about how well received the work would be by our membership. More than a few of our members loved the course as it was; simply didn’t see the need for the improvements. Did you have any design or construction documentation from Langford and Moreau? If so, to what degree did it influence the work? JN: The information available to us was a drawing from L&M which was completed in 1921. The routing shown on the plan is exactly as the course existed, with the exception of the 11th now being a short 4 and not a par 3 as shown on the plan. The plan was helpful, however, we also had an aerial photo from the 30’s which proved to be most helpful. In our minds, aerial photos often trump plans in terms of influencing the finished product. A plan does not always represent what was actually built. We had to be careful how we approached the project when discussing “restoration”. A true restoration was not at the forefront of the membership as the project progressed. What was evident to us was that to try and create something totally new was not going to be possible when one considered the earthworks created by L&M. We always look for natural land forms to place hazards so long as they work with the desired shot values and strategies. The features we look for were created and therefore we looked back to move forward. Restoration was not discussed often, but it was always on our minds because of the earthworks created by L&M. We did not put everything back exactly as it was, but we did try to where possible and where practical. In some instances there were features that no longer existed and would not be restored on a particular hole but were well suited elsewhere. These features provided inspiration for improving other holes. Original Langford & Moreau course map. Aerial of the course shortly after opening. Forse Design course improvement plan. Beyond achieving aesthetic and playability improvements, were there maintenance upgrade and/or sustainability aspects to the project? JN: There are with every project. Drainage was a major component of the project and we needed to create bunkers that drained well and at the same time were not going to require a budget increase to maintain them. It appears to date that has been successful. With the desire to improve the scale of the bunkers, we knew sand would be flashed higher up on the bunker faces. This can create wash-out problems if not constructed properly. We prefer a flat-bottomed bunker that saucers at the face and sweeps up to meet the grass above. Coupled with a synthetic liner and a proven construction method, we have been told the bunkers are holding up well, draining and experiencing very little to no washouts. BB: Prior to the project; the bunker washouts were a huge issue. Depending on severity; as many as 160 man-hours were required to restore the bunkers to a playable state. Playing conditions are greatly compromised for a day or more when that happens. That’s also very hard work and tough on employee morale when it takes place twice in the same week. What were the biggest challenges you faced during the project? BB: Let’s be fair; the scope of this project was originally greater. However, it was voted down by our membership in 2010. Patience was required before going back to the drawing board with a more appropriately sized plan. For me, revising the scope was a very difficult process; tough to match up the budget and scope of work. Additionally, the timeline for completing the work was very tight. JN: Looking back on it, there really were not many challenges that ultimately became unmanageable. Honing in on the scope-of-work was a challenge for the team until we got some numbers back from the contractors. Once we had an idea of solid bid numbers, our marching orders were more definite. Budget did resurface just before construction started. As mentioned earlier, we continued to stress the importance of scale throughout the process. There is a lot of sand surface area at Bryn Mawr. Before we started the project, we were asked to reduce the size of many of the bunkers and even eliminate a few. We were worried that this might impact the overall vision of the finished product. 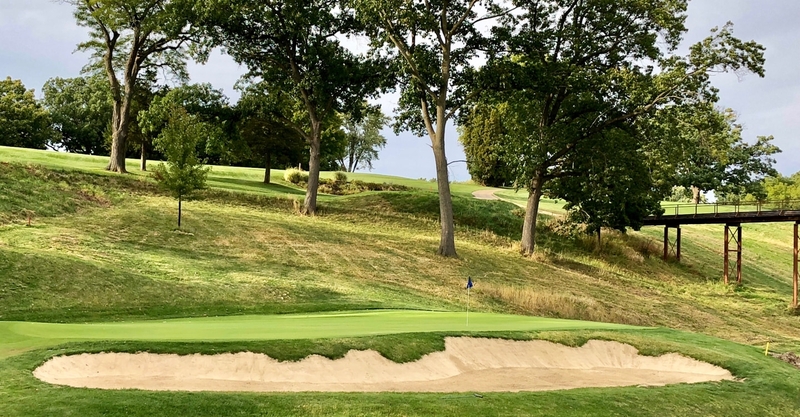 We were able to work within the parameters by reducing bunker square footages here and there, lower a few sand lines and still provide a product we were very happy with. The work at Bryn Mawr has been generally applauded as a huge success. When did you first realize that you had pulled off a victory? JN: Two times – Ron Forse and I truly work as a team. We try to collaborate as much as possible either in the office working on the designs or in the field challenging one another and providing input to help improve a project. Bryn Mawr ultimately became a project which I took the lead on. Ron visited the course just after we completed the project and was very complimentary of the work. Secondly, as I was flying out of Chicago on my last visit, the skies had opened up and dumped a significant amount of rain on the region. It will be the storm and flood Windy City residents will talk about for decades to come. I called Brian expecting to hear the worst about wash-outs, flooded bunkers…His comment was “no damage”. The bunkers held up to a devastating storm. BB: Member feedback was and continues to be very positive; that is the ultimate measuring stick. Despite no real topography; the look of the course has improved immensely. Additional teeing options have given every caliber of player an appropriate distance to play from. There is a lot that I like about the results! 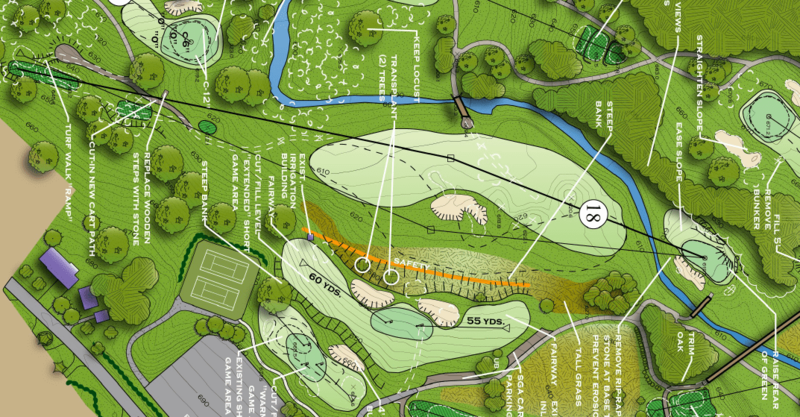 Bryn Mawr’s par 5 closing hole now has back tees added to increase challenge and flexibility of setup. Bunker repositioning adds to the interest and makes this hole an exclamation point on a classic golf experience. What is the thing you respect most about your collaborator (i.e. the other guy)? JN: Integrity and graciousness. Brian trusted us with a course that he has managed for quite some time. He always put his membership at the forefront as we discussed design ideas and solutions. He challenged us when we needed it and always listened to the ideas and concepts we were putting forth whether he agreed with them or not. In the end working with Brian improved my abilities as a designer and me as a person. BB: I’ve come to know Jim pretty well personally; he’s a man of character. This kind of work can be a political hot potato at times; he showed incredible patience throughout the process. As I stated, just getting to the starting line was challenging. Jim is also very humble; was trying to bring out the best of Langford’s work without being concerned with putting his own stamp on our course. When you trust the guy you’re working with, you can keep busy on the task at hand; I was never worried about any personal agendas. Forse Design has a very solid reputation and it’s well deserved. BB: I grew up to love the game of golf as a player, so I simply like being around the game. I also take pride in the course our staff prepares for play. If the membership enjoys their time here; that’s a benchmark of our success. Personally, I get most amped up for the member-guest days and our competitive events; really enjoy the challenge of seeing the heightened effort come together for a couple days of something closer to perfect. JN: This might sound cliché, but all of it. When it really boils down to it, I would say it’s being in the field seeing a design come to fruition. 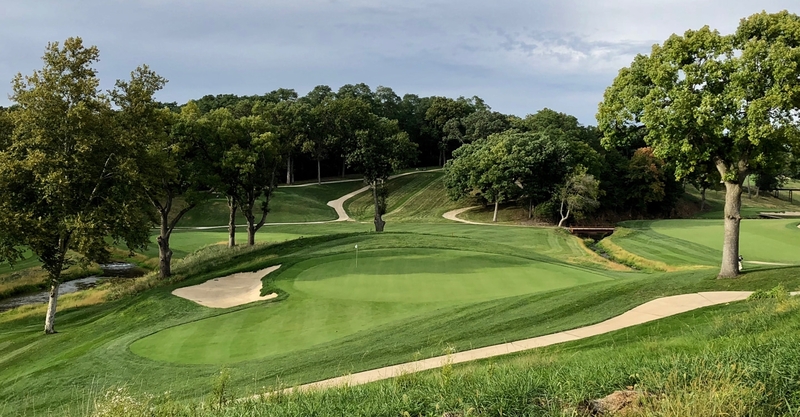 Whether it’s seeing the strategies played out; vistas being opened and the natural ground revealed through past masses of trees; or greens being expanded and the reinstatement of lost hole locations, all of it is very exciting. When restoring a course looking back upon the history of a facility is never dull. The architects of the “Golden Age” were geniuses. The game was much different then and courses were built primarily around risk and reward. Studying their tendencies and original creations is never boring. There is always something to learn. Any interesting or challenging projects in process or on the horizon for you? BB: I’m guessing this one was for Jim. For me; yes, trying to find a healthy work/life balance is a challenge. JN: 2014 was a banner year for Forse Design. We had a number of projects that have yet to be opened for play. To us, they are all interesting. So many of our projects are “hidden gems”. Lesser known courses designed by a variety of architects that are fun to play day in and day out. We can’t wait to hear how what the members think of the work. Places like Pine Hills C.C. 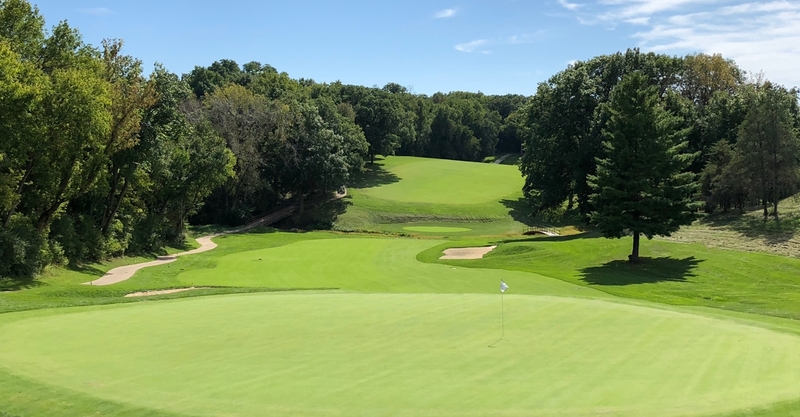 (WI), Lebanon C.C. (PA), Northampton C.C. (PA), Manufacturer’s G & CC (PA), Pine Brook C.C. (MA) and The Haven (MA) all performed significant work in 2014. 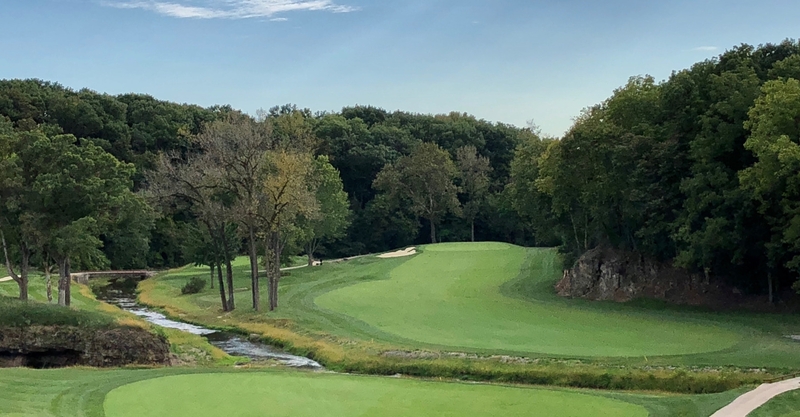 The project that consumed most of our time in 2014 was the complete renovation of Charles Alison’s Davenport Country Club. 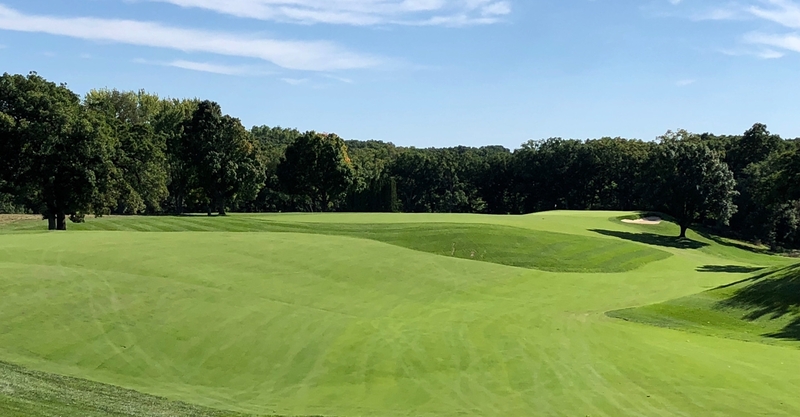 We built seven new greens, expanded and sand capped the remaining eleven, regrassed the entire course, rebuilt every bunker and tee, expanded fairways, removed hundreds of trees and built new practice areas in about six weeks. It was a great collaboration and one we cannot wait to see reopen. As for 2015 and beyond, we are excited that Lancaster Country Club (PA) will be hosting the US Women’s Open this year. We just completed work at Rolling Green Golf Club (PA) which will be hosting the 2016 USGA Women’s Amateur and we are currently preparing to do some work at Salem Country Club, host of the 2017 US Sr. Open. 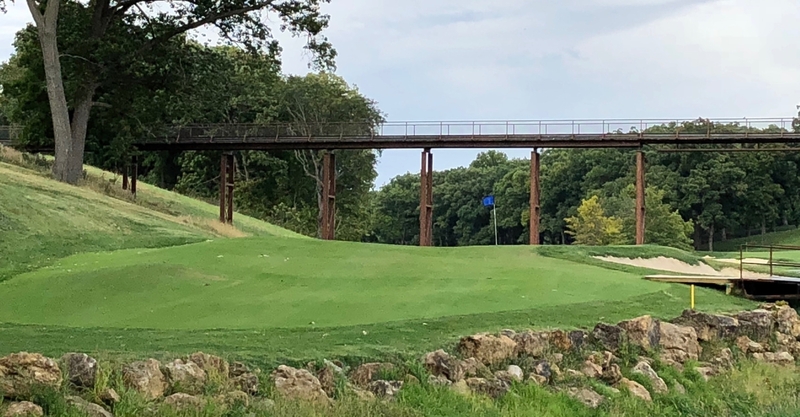 We also have another Langford and Moreau course, Minnehaha C.C. (SD) on the boards with thoughts of rebuilding in the next couple of years. One last project we look forward to seeing through to completion is Green Valley C.C. outside of Philadelphia. Green Valley was originally owned and designed by William Flynn. The course is now private but was designed as a public facility and its original layout did not rival Flynn’s many cherished Philly area courses. We have an opportunity to infuse great interest, variety and strategy into the course bringing it in-line with his other masterpieces. Yet, with all the work we have, there is one project looming that we have yet to secure – a new 18 hole modern classic that harkens back to the strategies and character of the Golden Age but can stand up to today’s playing equipment and golfers. For even more from Jim Nagle, watch his recent presentation to the Philadelphia GolfClubAtlas gathering courtesy of Matt Frey (on Twitter at @MFreyPGA). Categories: golf, golf course architecture, golf courses, golf industry | Tags: brian bossert, bryn mawr country club, forse design, golf course architecture, golf course maintenance, golf course photography, golf course renovation, golf courses, jason way, Jim Nagle, langford & moreau, ron forse, theodore moreau, william langford | Permalink.